Most experienced fishermen are partial and opinionated when it comes to off-shore lures and skirt combinations, and I don’t pretend to be any different. But most new fishermen, who don’t have enough experience to form strong opinions yet, are looking for some help and advice for trolling lure and skirt color combinations; I get calls from guys like this every day. It is with these folks in mind that I set out to write a few articles that can give a little guidance on choosing the right lures and colors when fishing for marlin or tuna. But catching sport fish isn’t about knowing how to confront them in the span of just a month or two; you need to know their whole cycle. That’s the only way to truly understand what works throughout various seasons. Make sure you read this article on the Colors of Spring, and my next about temperature and currents as well. If you’re trying to arrange a meeting with a monster, you will need to do a little homework. As with any battle, understanding your opponent is critical; you need to understand the fish itself. Understanding their movements and appetites, along with anticipating their behavior, will allow for greater success. If I can’t see the bait fish in the lure I’m looking at, I doubt the game fish will either. I am hesitant to believe that any game fish that hunts for bait fish everyday will be fooled enough to take a hybrid-looking lure that is half sardine, half mackerel, and kinda sorta a bonita. Some will swear by their favorite hybrid multicolored rainbow lure and insist that it catches tons of fish, but when you peel back the onion, you often find that the lure in question caught one or two, maybe a few, medium sized fish in the peak of the season. So let’s translate the mediocre success of that hybrid lure: it caught a schoolie or two. There were a couple hundred feeding-frenzied tuna in a pile, and one of the pack hit it. I have seen tuna hit the feet of floating birds when the ahi are in a full-fledged bait ball assault … but that doesn’t mean my favorite lures look like a shearwater’s foot. Let’s look at the feeding habits of tuna to understand why the mediocre hybrid lure seems to work now and then. Tuna are masters of bait ball evaporation. A group of ahi will cut out a section of a large school of bait fish, let’s say on this occasion that they are mackerel scad, and push it up to the surface. That’s an important element, the surface, because that’s where ahi trap bait and feed. They feed deep, sure, but that’s a different article. For now we’re trolling, so roll with me. These ahi work cooperatively, often with dolphins. When you see dolphins and birds, it is likely that there is a pile of ahi working below; they’re not feeding off the bottom of the ball but working it, keeping it tight. Feeding ahi come in from the sides, slightly angled upwards. Because of where their eyes are on their head, this approach offers the optimal visual angle. They strike with stunning speed, pop out the other side and stage up at the bottom so they can keep the ball tight until it’s their turn again. It’s not as orderly as a grade school fire drill but the basic mechanics are there. The hunters tolerate each other very well, until the bait ball is worked down to the last 10 or 20 pieces of bait, which surely by now must realize that their limited time on earth is about to expire. There are always a few greedy pigs in the group that break ranks and try to wipe out the last few baits. The school breaks off and a few remaining baits still struggle to stay together. It’s futile; a couple of big boys from below will cover 100 feet in half a second, and the last of the bait ball is just some shiny scales suspended in the clear blue water. Now that bait ball is evaporated and the feeding frenzy is done. Here comes a Bertram with 5 lines out. They have a 14 inch marlin plunger on each corner, a set of 12 inch pushers on the riggers, one blue and one purple, and a 9 inch bullet running shotgun that’s a blue/silver cross between a sardine and a herring. The boat captain saw the commotion in the water and saw the birds, so he knows he is in the right spot. But the action is over, and he motors over the top of a hundred yellowfin 100 feet down. No strikes. “They must have gone down,” he says to his disappointed anglers. Those ahi were brain-locked on green colored mackerel, and the Captain had nothing in the water to match what the ahi were mentally locked into. The truth is, at that moment, he would have gotten a hit on a hot dog, hold the mustard, because the timing was perfect. The boat was rolling on an excited school of feeding ahi. But timing is rarely perfect. More often than not we have open water, we’re late to where the action was, and all the birds are sitting on their butts floating around like they’re waiting for the bus. So let’s not rely on timing and chance. Let’s choose the right bait. Let’s go back to that mackerel scad bait ball with the right lures, with lures that are accurate. The ahi are finished with the feed. They’re moving slowly at 6 knots, 20 fathoms down, and here you come with 5 lines out. You’ve got a 14 inch plunger on short corner, a 9 inch smoker on long corner in blue/silver over green/gold (mackerel scad.) The short rigger sports a 9 inch jetted bullet in blue/silver over black/pink (top gun/bonita), and the long rigger runs a frog (mackerel), and shotgun is dragging a root beer petrolero. The 14 inch plunger means nothing to the ahi, but the long corner comes into view and it looks just like one of the mackerel scads they were just feeding on. The instinct to wipe out the straggler kicks in and 3 ahi rush the corner; one takes the bait, the second ahi sees the bonita-looking bait running on short rigger and is not interested. But the third ahi circles around, sees long rigger as another mackerel straggler and hammers it. You got a double, the boat comes down to neutral, you’re clearing lines, the deck is in chaos. Underwater, the pile circles one time to see what’s going on, and here comes the squid swimming erratically because everyone is busy and someone is reeling up the petrolero on shotgun. That dancing squid is too good to pass up, and your double just went triple. A wondrously genuine chaos has just swept your deck. Summer / warm water is a time for accurate, bait-fish-looking baits. Dress them for tuna, because outside of a bait ball frenzy, tuna are the toughest fish to fool, especially when they get brain washed into cooperative feeding. What I mean by this is that tuna won’t hit skipjack baits when they are feeding side by side with skipjacks and cooperatively eating anchovies. Even after that cooperative feed, for a while anyway, they will have anchovies on the brain, and not skipjack. The beauty of tuna baits is that they are typically the best looking baits you have. Mahi Mahi and Ono will slam 99% of all good looking tuna baits. Marlin will rise to their calling, but will see a bigger, fatter bait on your corner and nail the big plunger. The secret to tuna fishing in the summer is to keep 2 or 3 species of schooling bait fish imitations in the water everywhere you go, and reserve a corner for the marlin bait. If you are marlin fishing that doesn’t apply. Instead, run 3 plungers: 14’s on each corner and a 12 inch on short rigger. The other slots you can load with 9 inch ahi baits so the team can pick up an ahi and a few Mahi while you hunt for billfish. Run full size baits to match the fully developed baitfish that are in the water. You can read more about this size aspect of lure choices in my next article about temperature and currents. The ahi, Mahi Mahi and Ono that you’re trying to catch survived the spring/summer onslaught of fisherman, so there are not as many dumb ones out there right now as there were in the spring time. For these more experienced fish, you will need good looking baits that identify as a species to the discerning eye of the practiced hunter. 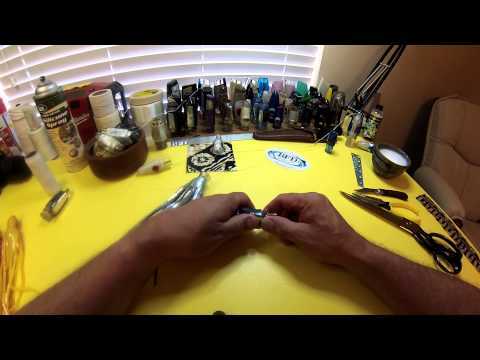 Be accurate and don’t go with hybrid lure and skirt colors and make mutant baits. A sardine is a sardine, and if there are sardines around then don’t run a sardine/mackerel hybrid. You can learn what’s in the water by asking around or looking at fresh fish in the market. The fish market will sell the schooling baits in the water for humans to eat: herring, sardines, skipjack. It’s not hard to find fresh catch for sale at the markets, and that will tell you what’s in the water and what colors to run. Remember that baitfish in the water right now are more mature than the hatchlings of spring. Summer is about fully developed colors and fins, wings, and brilliance. Males need to identify themselves as potential mates, so colors count, and brilliance is a visual cue that proclaims health, maturity, and a willingness to reproduce. To fish like tuna, which see in full color, it is a powerful visual language. To a fish that whose vision has 1,500 shades of black and white, like a marlin, it’s all about contrast. Blue/silver with dark spots or bars down the back is a good start. Put it over a skirt that pushes out some pink color through the belly like it’s an overstuffed or pregnant skipjack, and it’s a tough meal for a marlin to pass up. Follow that skipjack (which may get completely ignored) with an assortment of local baitfish. A mixture of blue and green, sometimes almost all green, sometimes mostly blue. It’s common to have a flash of yellow laterally, or darker bars down the back. Also good is blue with dark squiggles running 3/4 length down the back over a hot pink. Most mackerel/scad/goggle-eye outside skirts do really well over black/red with a yellow stripe or purple/pink with a yellow stripe. Another good one is blue/silver with a yellow stripe over green/gold glitter with a red stripe. This is a great producer. Green/white with wide dark bars down the back, over black/red with a yellow stripe. Frog is really a summer slammer! Blue/silver or blue/silver with a yellow stripe, usually best over a hot pink with another color to cool it off a bit. Hot pink/orange with a yellow stripe, translucent blue/pink with a yellow stripe, and add wings. Both herring and flying fish are very shiny and any extra flash is a good thing. Blue/silver over red/yellow. The yellow/red on the inside runs with the red down against the silver of the outside skirt. It’s a great ahi bait that Mahi Mahi will crush. For Mahi Mahi, it’s good to run this combination on a white pearl, or a mother of pearl head. Don’t ask me why, it just is, and bull Mahi really respond to it when it’s on a white head or run on a nice pearl head. Blue/silver with a yellow stripe over black/pink with a yellow stripe. Run the black down against the silver of the outside skirt, so the pink is up against the blue. The inside black will pop through the silver belly and show up as black lateral belly lines, which is distinctive to tuna family baits, like bonita, skipjack, and False Tunny (kawakawa). Top Gun is a grand slam combination on every size bait I have run: grand slam on 7 inch, grand slam on 9 inch, grand slam on 12 inch, it is just a great bait in any water. Top Gun likes matching heads: blue-back heads that blend in with the skirts, or blue glitter heads. A mother-of-pearl blue back smoker with jets is an ahi hammer when you dress it in Top Gun. Everything will hit it. This needs to run on a purple head that’s not too glittery, kind of a muted color head. Larger ahi will hit it as well. Use black/silver over blue glitter or over ice blue. My favorite is black/silver with a red stripe over the assassin ice blue skirt, on a black back head that is super glittery or shiny with broken mirrors pieces. Add some short shiny wings, real flashy. These baits school by the zillions, and they run about 10 inches (25cm) overall length in the summer. The entire ocean eats sardines! Deep blue tinted heads that are super heavy, with 360 degree deep blue glitter outer skirt, over translucent blue/pink with a yellow stripe. This is a gorilla ahi bait, and needs to run on the nicest 4 sided mother-of-pearl head you have. Jets are preferred, the heavier the better. It will not go off as often as other baits, but when it does it’s usually a really good fish. The above are mostly great tuna baits, and great tuna baits usually slam Mahi Mahi and Ono. But there are a few baits that drive Ono crazy, and make Mahi Mahi chase the boat. These bait color combinations won’t make sense to us as humans, so don’t spend a lot of time trying to rationalize it out. Most of these combinations came from a couple old-time Japanese guys that took me under their wing when I lived in Saipan and fished the Marianas Islands. They worked for me there, they worked for me in Hawaii and they worked for me in the Atlantic and the Gulf of Mexico; that’s proof enough for me. For Ono (Wahoo): Pink/White over all Black. This is a combo from Donald from Yama’s in Kona. Run it on a jetted smoker. It’s deadly on Ono. They will hit it even when you’re at a dead standstill fighting other fish, if you accidently leave it dangling in the water. In the Atlantic and the Gulf of Mexico, big king fish drill this bait. Several big Ono over 90 pounds met the gaff by hitting this bait in open water. For Ono and Mahi Mahi: Strawberry Alarm Clock. All black with a bit of silver glitter over orange with gold glitter. This is a bull Mahi killer. Ono will slam it, and bull Mahi can’t resist it. For Mahi Mahi: The Banana Man. This is a white or amber bullet with jets, dressed all yellow over all yellow. Stupid good for Mahi Mahi. They go nuts for pure yellow (cannibalistic maybe?) and it works just as good if you put a black skirt over the yellow skirt too. One more deadly combination for Ono: Hell-Razor. This is red/pink with a mid-skirt dark splotch over red/pink with a mid-skirt dark splotch. Pure Ono bait in the summer that turns into a solid producing ahi bait when the water turns cold. When you run it on a red bullet with pearl slabs, it would be a first pick to win an Ono tournament. We’ve covered a lot of information and baits so far, and you have what you need to get a box full of ahi, Mahi and Ono. We started the discussion with tuna, because you might as well start with the most discerning fish with the best eyesight and dynamic speed, not to mention that it is a sought-after prize. Now it’s time to talk marlin. Next up, we will talk about lure size, temperature and water currents, marlin patterns and behaviors, and finally, what makes a truly great lure.